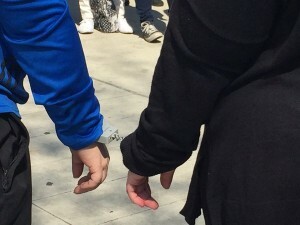 “We need the library to do more than apologize,” protester Jessica Raven said Saturday. 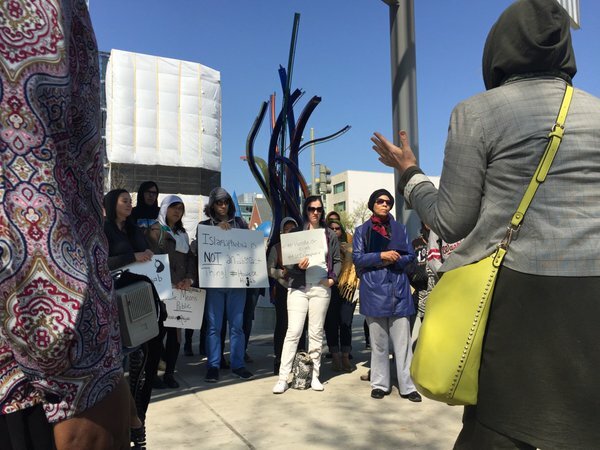 WASHINGTON — A couple of dozen protesters gathered outside Shaw Library in protest of what they called a rise of Islamophobia, after a woman on Wednesday was ordered by a library police officer to remove her hijab. Raven is the executive director of Collective Action for Safe Spaces, which an organization that speaks out against harassment. She says the D.C. library system is minimizing what happened by calling it an “isolated incident,” adding that she wants to see more public institutions make an effort to combat Islamophobia head-on and make Muslims feel more welcome. The organizers of the rally say they hope to raise the issue during a D.C. Council budget hearing April 13 that focuses on the library. Carole Mu’min, an African-American Muslim woman who lives in Shaw, says those who live in fear are taking the wrong approach to things. “Stop that fear talk. Know your neighbor. Speak to your neighbor,” Mu’min says. She says living fearlessly is how Shaw was made safer from drug dealers and drug violence, and that those gathered need to stand up and not let others intimidate them.